See his SSRN page and his Guest Blog. Professor Jonas-Sébastien Beaudry teaches and researches in disability and health law, disability studies, legal theory and human rights. From 2005 to 2006, he clerked under Justice Marie Deschamps at the Supreme Court of Canada, and served as well at the International Court of Justice under Judge Sir Kenneth Keith and Judge Peter Tomka (2007-2008). He worked for 15 months in the Inter-American human rights system in Argentina and Costa Rica and his first book, Dialogues démocratiques en Amérique latine (PUL, 2008) examined how freedom of expression could secure access to the public sphere in a Latin American context. 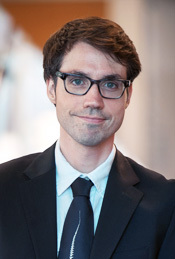 Before joining McGill’s Faculty of Law and Institute for Health and Social Policy in 2018, Jonas Beaudry held Lecturer positions in law at McGill University and the Université du Québec à Montréal, as well as the position of Visiting Adjunct Professor, at the philosophy department of San Francisco State University, and teaching appointments in human rights at St. Catherine’s College, Oxford. From 2015 to 2018, he was an Assistant Professor of Law at the University of British Columbia, and served on the President's Working Committee on Disability Culture, Art, and Equity during this time. Professor Beaudry has been the recipient of numerous prestigious fellowships throughout his educational career, including both the Trudeau and SSHRC doctoral scholarships. He completed a doctoral dissertation entitled “Can Social Contract Theory Fully Account for the Moral Status of Profoundly Mentally Disabled People?”in 2014. His publications include articles in a number of areas, including bioethics, legal history, human rights and disability theory. He has presented at academic series and conferences across North America and Europe, and he has advised disability organizations since 2015, including the Vulnerable Persons Standard. Assistant Professor, Allard School of Law, University of British Columbia, Vancouver, 2015-2018. Postdoctoral Fellow, Biomedical Ethics Unit, McGill University, 2014-2015. Boulton Research and Teaching Fellow, Faculty of Law, McGill University, 2013-2014. Henigson Fellow (Harvard Human Rights Program), Center for Justice and International Law (Buenos Aires office), 2008-2009. University Trainee to Sir Kenneth Keith and Peter Tomka, International Court of Justice, 2007-2008. Law Clerk to the Honourable Marie Deschamps, Supreme Court of Canada, 2005-2006. “The Vanishing Body of Disability Law: Power and the Making of the Impaired Subject”, (2018) 31(1) Canadian Journal of Family Law: 7-55. “The Way Forward for Medical Aid in Dying: Protecting Deliberative Autonomy is Not Enough”, (2018) 2nd Series 85 Supreme Court Law Review: 335-385. Also published as a chapter in: Assisted Death: Legal, Social and Ethical Issues after Carter, ed. Derek B.M. Ross, Lexis Nexis, 2018. “The Intellectually Disabled Witness and the Requirement to Promise to Tell the Truth”, (2017) 40(1) Dalhousie Law Journal: 239-278. “Welcoming Monsters: Disability as a Liminal Legal Concept”, (2017) 29(2) Yale Journal of Law & Humanities: 291-338. “From Autonomy to Habeas Corpus: Animal Rights Activists Take the Parameters of Legal Personhood to Court”, (2016) 1 Global Journal of Animal Law: 3-35. “Beyond (Models of) Disability?”, (2016) 41(2) Journal of Medicine and Philosophy:210-228. “The Anxious Heart of Injustice: Negative Affective Responses to Disabilities”, (2016) 5 Bioéthique Online: 1-16. “A Task-Sensitive Ethics of Motivation” (2015) 6(1) American Journal of Bioethics Neuroscience: 22-24. Associate Member, W. Maurice Young Centre for Applied Ethics, University of British Columbia, 2016-2018. Disability Law and Disability Studies; Health Law and Bioethics; Legal Theory and Human Rights.